This design provides for excellent linearity and repeatability, low hysteresis and long term stability. 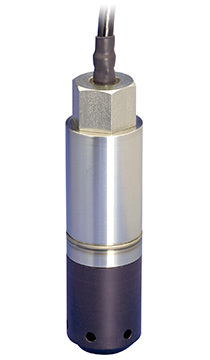 The Model SDT is easy to install; simply lower the transducer into a vessel or well. It’s that easy. All the electronics are mounted in a submersible 316 stainless steel housing. A special cable support bracket is also available. This gives extra stability to the transducer when used with longer lengths of cable (up to 2500 feet) or when used in an agitated liquid. A conduit adapter is also available. The transducer is available calibrated for any span needed, from 0 to 1 psi or 0 to 0.07 bar (0 to 2.31 feet or 0 to 0.7 meters of water) to 0 to 300 psi or 0 to 20 bar (0 to 690 feet or 0 to 211 meters of water).